In America, the name Casse has always been intrinsically linked with Florida and the 2-year-old markets, almost in the way the Head or de Chambure family names permeate Normandy and the French racing industry. So at first, it comes as a bit of a surprise that one of the most active and enthusiastic participants in the international marketplace the past few years has been a young American bloodstock agent whose roots and home may be in Ocala, but whose heart clearly more and more belongs to Europe, particularly France. But dig a little deeper, and just behind the slight Southern U.S. accent and effacing manner, you find that Justin Casse may well have been preparing to fill this niche in the market for a lifetime. Casse, 35, is a graduate of Florida State University with a degree in international affairs with a concentration in European geography. He is the youngest son from one of America’s great racing families; his father, Norman Casse, is the longtime director of the Ocala Breeders Sales Company; his brother, Mark, is a successful trainer who took this year’s GI Breeders’ Cup Mile with Tepin; and nephew Norman W. Casse is now following Mark into the training business, serving as his assistant. Casse left Deauville Sunday after a nearly four-week European swing which saw him make purchases at Goffs November, Tattersalls December and Arqana, and also serve as the underbidder on several other lots, including the session-topper from the last day of the mare sale at Tattersalls, Farandine (GB); and a €160,000 Redoute’s Choice foal Sunday at Deauville. 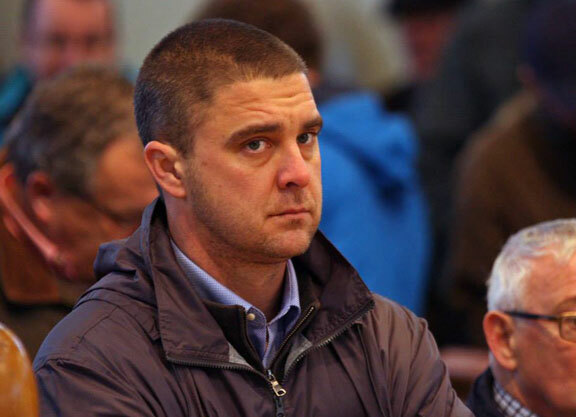 He was also one of the bidders on the Tattersalls sales 2.7 million guineas topper Hanky Panky. The diversification of his business and expertise in European markets has been a source of growth for Casse, whose first job post-college was as working as a groom for his brother, Mark. He followed that up with a stint at Paramount Sales and then started Casse Sales at the age of 24, selling horses for Eugene Melnyk, Kinsman Farms and Sez Who, among others. The first 2-year-old he sold, a Rahy filly for George Steinbrenner, brought $500,000. It was his only entrant in the sale. While he got his start as a 2-year-old specialist, he has expanded far beyond. Casse first accompanied David Ingordo on a European trip four years ago, and started coming back on his own the following year. The trip proved worthwhile, indeed, this year. Casse purchased three at Arqana; a 2-year-old U.S. Ranger filly out of Wandering Star who is a half-sister to G1 Dewhust S. winner War Command (War Front) from Ecurie des Monceaux for €100,000; a foal by Declaration of War, also from the Monceaux Consignment, for Kinsman for €40,000; and the 3-year-old filly Voyelle (Broken Vow) from Wertheimer et Frere for what seems a bargain €30,000; she has been twice placed at Deauville and is a half-sister to Olmadavor (A.P. Indy), a multiple graded stakes winner in the U.S.
From Tattersalls, he brings home Senses of Emirates (Bernadini), for 60,000gns, a 2-year-old filly who has run twice on the all-weather in the U.K. and whose dam is GI Ballerina H. winner Harmony Lodge (Hennessy); a Raven’s Pass foal who is a half-sister to U.S. Grade II winner Ramazutti for 110,000gns; and a Dark Angel (Ire) colt, which he bought in partnership with two others under the New Providense Farm banner, for 45,000gns. At Goffs, he picked up a colt by Showcasing (GB) for €43,000. Casse outlined plans for the group, most of which are headed home to America with him. Casse said he now plans to do the trip every year, and will also return to the Arqana August sale each August. “Coming to Europe has allowed me to do business and create opportunities with people with whom I normally wouldn’t have opportunities, because I’m one of a handful of Americans who come over here,” he said. “I’m one of three or four Americans in France right now, so if someone needs something, I’m here. If you go to Keeneland or Fasig-Tipton or any bloodstock sale in the United States, every reputable bloodstock agent attends every sale, or owners can look at horses themselves. So this offers representation in a place where there are few choices. I guess that means they have to call me,” he said with a smile. But while Goffs, Tattersalls and Arqana all offer great business opportunities, it’s clear that Deauville offers something more to Casse. Not content to be confined by Europe and America, Casse heads next to the Cape Premier Yearling Sale in Cape Town, South Africa Jan. 21-22 before heading back to Florida to prepare for the spring 2-year-old sales, where he has no fewer than 20 2-year-olds selling in which he is part-owner. He counts as his biggest European success the purchase of Esentepe (Ire) in foal to Frankel (GB) last year at Tattersalls to top the first session at 525,000gns.